Vincent: It's the little differences. I mean, they got the same $#!t over there that we got here, but it's just – it's just there, it's a little different. Having a child is fun. Yeah, it's also a ton of work, but one of my favorite perks is reliving aspects of my youth through a fresh new set of eyes. I've been collecting Masters of the Universe Classics since about 2009, so for the past three years my young son has watched the display case in the living room slowly fill up with characters. He is captivated by their appearances and relishes the times we take them out of the case and play with them. One day while we were playing, I told him that the old Masters of the Universe figures came with a mini-comic that told their story. He flipped-out with excitement, eager to learn the stories behind their appearances. 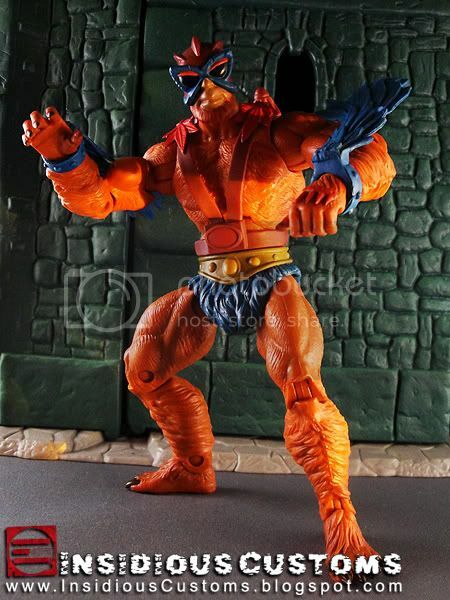 There is a third member of Skeletor's gang that appears only on this page that has the head and wings of Stratos and the toy colors of Beast Man. 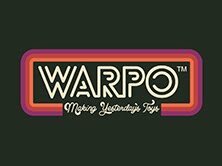 Having read much about the history of these original mini-comics and how early-on the affiliations of many of the characters including Stratos were not 100% determined, I explained to my son that this was a mistake. Since this was the first comic, they hadn't figured out all the characters yet. 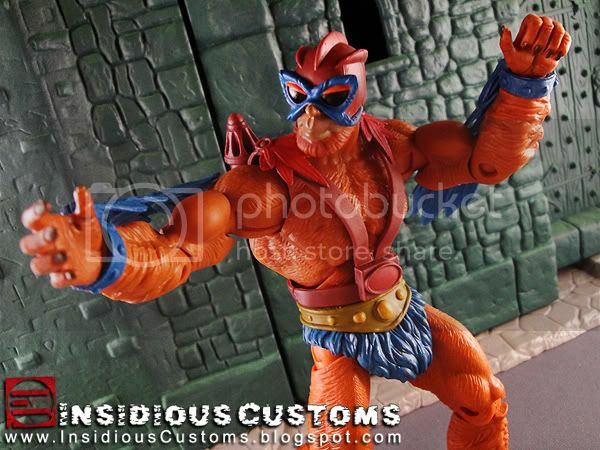 "Beastos" utilizes the body of MOTUC Beast Man and the head and arm wings from the TRU exclusive DC/Masters Stratos. (We took some creative license adding the jet-pack.) I used the hot water/pop method to swap the parts. And the only paint I used was orange on the beard and eyelids. With the addition of Beastos, my Pre-Filmation shelf is almost complete; He-Man (double gauntlets and white boot tops), Teela (blonde), Skeletor (Alcala style head), Green Goddess, and Mer-man (blue). The addition of EvilMike's Alcala Style Power Sword halves is a cherry on top. I hope you dig Beastos as much as my son does. If you like him, I encourage you to make him for yourself. And once again I hope you see that "The Little Differences" can make a big difference in your collection. Until next time, I remain The Insidious One. 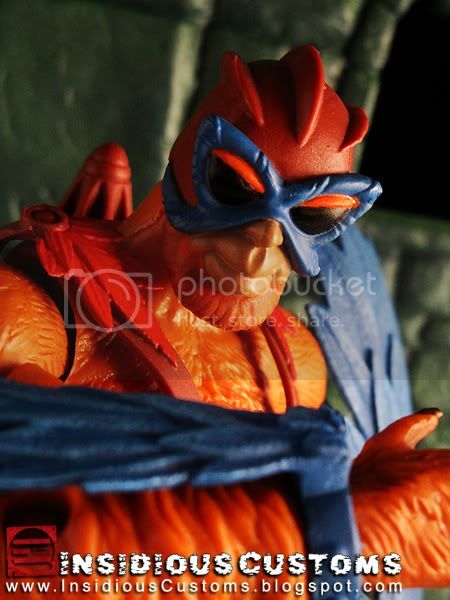 "An Avian male fell in love with a female of Beast man's race. 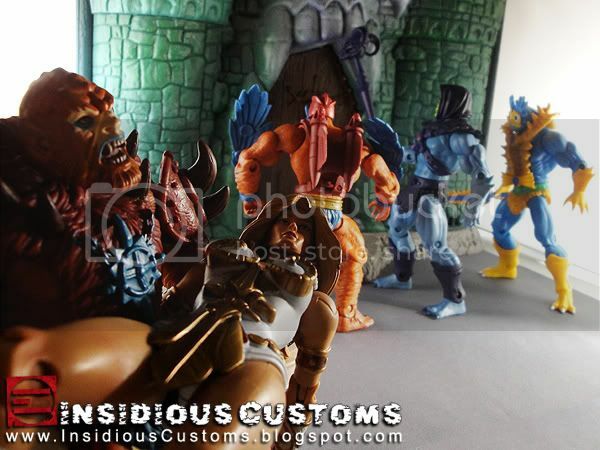 When Beastos was born, neither culture accepted him and so he joined Skeletor's Evil Warriors." 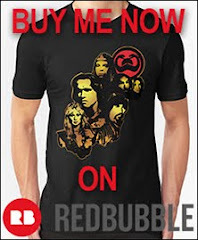 Way cool. 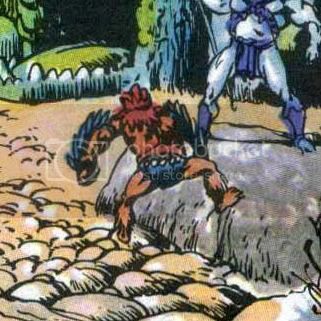 I notice also that character when I read the story at He-Man.org,yet he is not seen again on any of the other pictures from the mini comic. 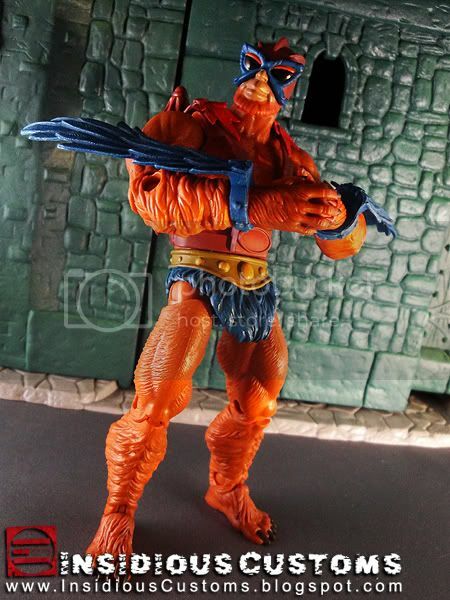 In light of Faker and Stinkor it's amazing that no one at Mattel in the 1980's tried making a new villain this way. Bravo! Thanks for the comments. 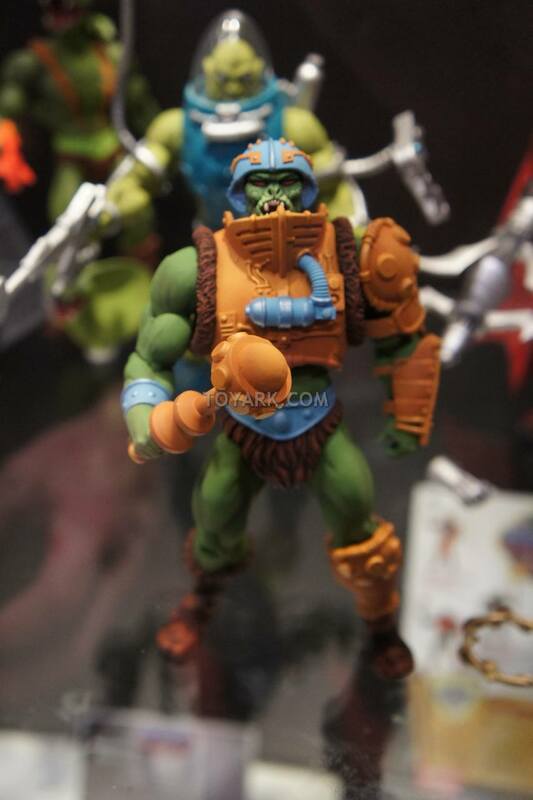 In the end, perhaps Stratos' sly smiling face sculpt saved him from joining Skeletor's ranks.